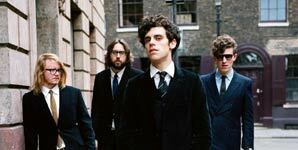 Noah And The Whale today announce details of a major UK tour for 2012. The band - whose Last Night On Earth has, since its release last spring, firmly established itself as one of the Albums of 2011, will play shows 11 shows in March/April, including one at The Royal Albert Hall. Noah And The Whale are currently in the middle of their biggest tour so far, with dates including a show at London’s O2 Brixton Academy on October 26th. The current dates are accompanied by Waiting For My Chance To Come, the latest single to be taken from Last Night On Earth, one of the highest selling albums of the year. Waiting For My Chance to Come is accompanied by a video directed by the American photographer Autumn de Wilde. Following the current UK tour, the band heads to the US and Mexico for further dates.